North Korea has warned of "substantial and high-profile important state measures", days after announcing plans for a third nuclear test. 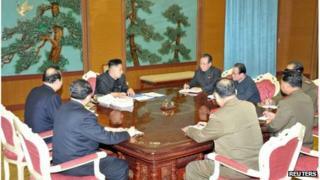 North Korean leader Kim Jong-un made the statement during a meeting with top security officials, state media said. The reports did not give details of what the measures might entail. North Korea has issued a series of warnings since the UN tightened sanctions against the country this week over a recent rocket test. On Thursday, the North said it would proceed with a "high-level" nuclear test in a move aimed at the US, its "arch-enemy". A day later, it promised "physical counter-measures" against South Korea if it participated in the UN sanctions regime. North Korean state media reported on Sunday that Mr Kim had "advanced specific tasks to the officials concerned". The latest warning came after Rodong Sinmun, a state newspaper, carried an essay on Saturday saying that a nuclear test was "the demand of the people". "It is the people's demand that we should do something, not just a nuclear test, but something even greater. The UN Security Council has left us no room for choice." North Korea has conducted two nuclear tests in the past, in 2006 and 2009. It has given no time-frame for its third test. The UN resolution, passed on Tuesday, was proposed by the US and backed by China, North Korea's closest ally and biggest trading partner. It was a response to a rocket launch in December that the US, Japan and South Korea say was a test of banned long-range missile technology. The three-stage rocket put a satellite into space in what was Pyongyang's first successful test of such technology. The UN resolution pledged "significant action" if North Korea carried out a third nuclear test.